Has the Automobile Tire World gone Mad? Before I begin on my own rant, I will share my favorite rant from art/film for you to enjoy. Let me set the stage in this way. Before beginning the off-road driving season this year, I'm getting the rig ready. That process involves checking EVERYTHING and replacing any part that is in the least bit worn or suspicious. (LSP, I swapped out all of the radiator hoses and the serpentine drive belt last year) This year, I changed the gear oil in the front and rear differentials and the transmission. There was a rear differential breather valve that had been torn off with rough running that needed to be replaced and the E-Locker (locks the rear differential electronically) wires were torn out - likely the same rough running that finished the breather valve. This year, the tires are all being replaced. They have good tread on them for the most part and even though they are "E" rated with three ply sidewalls, they can also develop 'dry rot' for want of a better term (as any tire can). Thus I could wait for them to fail somewhere in a forsaken stretch of BLM land between hell and breakfast, or I could replace them now. Thus the subject of the rant. The solution to the problem is to use 'bead-lock' wheels with a special ring that is bolted into place to hold the tire where it belongs even if the tire is barely inflated. 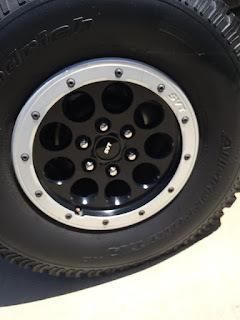 The photo (right) is of a stock bead-lock wheel made by Ford for the Raptor. In this case, it's on my 2014 Ford Raptor. Note that it's standard factory equipment. That won't mean much to you but hang with me as the rant continues. Keep in mind that it's FACTORY OEM EQUIPMENT. There are many types of bead-lock wheels and retrofits made by many manufacturers for many off-road uses. 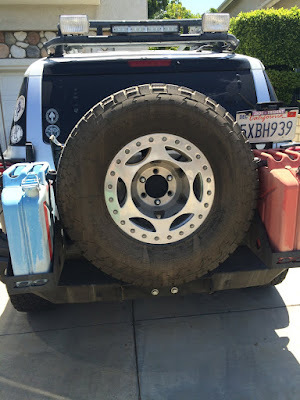 My 2007 Toyota FJ Cruiser is heavily modified with (very heavy off-road/off-trail/get out of the mess that you got yourself into by being stupid) applications. Among those modifications areWalker Evans bead-lock wheels with Nitto TG 305/70/R17E tires. The tires are substantially wider than stock, and are substantially tougher than stock. 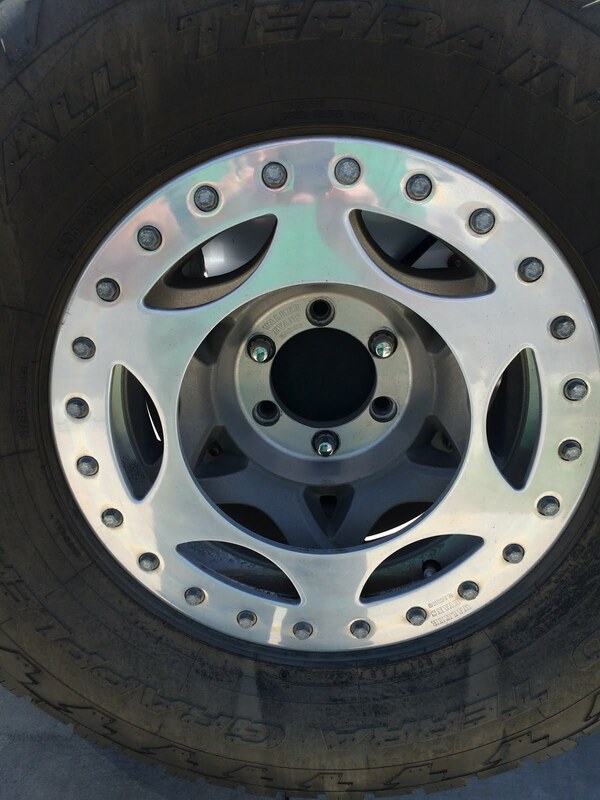 The wheels are cast aluminum and are exceptionally tough. When the vehicle goes into the crusher (after I'm dead), the wheels will still be fine. Note the fact that there are 24 individual bolts that hold the tire firmly to the wheel. I realize that I live in Southern California and the natural assumption that it is populated by a bunch of "progressive" freaks who belong to the Sierra Club and hate 4x4's, but within 5 miles is just about every possible OEM and after market manufacturer for 4x4 parts. There are a lot of serious off road enthusiasts in my area. 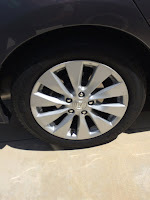 I have contacted EVERY tire store in my area to get the 5 replacement tires (4 + spare) that I want to buy - and we're talking about $1,500 in tires, mounting and balancing. In every case, they told me that they won't work on bead-lock wheels. I used to have the work done at Big O Tires and paid them $25 per tire extra to remove, reinstall and torque wrench the locking rings. They told me, as have all the other tire shops that lawyers have cautioned them against that. I found a shop in Oceanside, fifty miles from home, that will do it. I'm not lame, I can do it myself, but I'd rather hire the work done because I'm lazy. But their lawyers said "no". WHERE ARE THOSE LAWYERS? - DELIVER THEM TO ME! HANGING IS TOO GOOD FOR THEM! I'm thinking a large ant hill deep in the heart of the Mojave with about a gallon of honey. The only question is whether the ants, the buzzards or the coyotes will get there first. I'm confident that they were Obama voters, that they never knew who their fathers were, hate mom and apple pie as well. Unless the political elites who own the GOP steal the nomination from Trump (and Cruz - if they screw Trump, they'll screw Cruz too because they hate Ted and fear Donald), he will be the Republican candidate for President of the United States. Tomorrow he is likely to 'run the table' on the Eastern Seaboard'. The Media and the elite of the GOP both screwed the pooch by not seeing it coming. Life is good when you're a political parasite living inside the beltway eating other men's bread or in New York City where they only spoke with those of their own leanings (New York is as much a bubble as the Washington DC beltway). (Washington Examiner) David Brooks, a conservative columnist for the New York Times who has said he would never support Trump, offered perhaps the most startling confession. The media "expected Trump to fizzle because we were not socially intermingled with his supporters and did not listen carefully enough," he wrote at the Times in March. "For me, it's a lesson that I have to change the way I do my job if I'm going to report accurately on this country." Brooks' words shook his peers and offered a flicker of remorse for what the media has become — arrogant and isolated from a large portion of the country. Trump's campaign message remains simple while rejecting political correctness. (1) Protect the American economy. (2) Protect American borders (an effective wall separating the US and Mexico and serious scrutiny of Muslims who come to America). (3) Rebuild a military that has been weakened from 8 years of gross neglect and care for veterans, many of whom have been treated shamefully by the Veteran's Administration. (4) Restructure the tax system without radical changes. Part of this is to encourage people to repatriate $2 trillion overseas and invest it in the US economy (5) Shrink government and the cost of government. (6) Make the nation business friendly to promote the creation of jobs. There have been other more subtle notes to what he's said. South Korea has a vibrant, thriving economy. Why aren't they paying the US for the protection that we provide from a rampaging Communist rogue nuclear state (North Korea), run by a fat, syphilitic, little dictator? What about NATO? Do they pay their fair share. The same can be said for the UN, which is little more than a vehicle for offering diplomatic protection to spies who visit UN headquarters in New York City. Trump knows what we all now know to be true. The US and Canada have the largest proven oil reserves in the world - by some margin. We don't need the Middle East and can be energy independent. We're not Europe. I know that there have been some in the Trump camp that are talking about a natural gas pipeline from the US to Europe. Don't laugh. It can be done. Trump is wrestling with ways to pay of the $20 trillion that we owe. Kasich is jonesing for a seat at the big table. It's not impossible that he'll end up as Trump's vice presidential nominee. The polls show him out performing Cruz on the Eastern Seaboard and he can deliver Ohio. The Democrats (when Hillary is indicted) will have their favorite ox gored by her own criminality (and help from the FBI). That means that the likely 45th President of the United States will be Donald J. Trump.